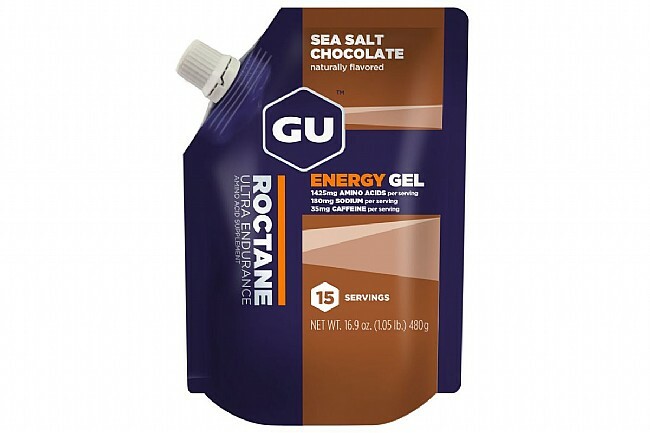 Roctane kicks the GU formula up a notch to prevent lactic acid build up, boost recovery, and prevent muscle damage. With this 15-serving pouch designed for use with GU's reusable 5-serving flask, now you can easily carry enough gel for long days in the saddle without the hassle or waste of carrying multiple single-serving packets. The Roctane formula starts with GU's original recipe and adds more sodium and branched chain amino acids to combat exhaustion, increase focus, and promote muscle recovery during prolonged exercise. 100 calories and 35 mg of caffeine per serving. Take one serving 15 minutes before exercise and then every 30-45 minutes during activity with water. Tasty, great preride or post. Lasts long without refrigerating. Can be a little messy, but the flask is easy to use and the money savings and waste reduction makes it well worth it for me. The sea salt chocolate flavor is my favorite!